Edwardian engagement rings are specialized vintage engagement rings that highlight the intricacy and beauty of elegant, romantic design coupled with the stunning symbolism of a gorgeous gemstone. The Edwardian Period, also call the Belle Epoch or "Beautiful Era," was a period of extravagant luxury in both fashion and jewelry. Historians generally label the Edwardian Period from 1901-1910, during the reign of King Edward VII, though the designs were consistently popular until around 1920. This is prior to the art deco period and engagement ring designs did not yet embrace modernism and geometric forms; instead, they focused on romantic traditionalism with exquisitely detailed settings that illustrated the wearer's social status by virtue of their intricacy. At the same time, the romantic imagery and sultry fashions of different rings held firm to traditional ideas of love and commitment that demonstrated the optimism and youthful exuberance of marriage. Elaborate filigree patterns along the ring band and crown, including pierced patterns and integrated designs. Use of multiple accent stones that are much smaller than the center stone - pave setting engagement rings were particularly popular during the Edwardian period. Contoured rings and arches with subtle curves to coordinate with the filigree and scrollwork overlay. Romantic imagery such as flowers, birds, vines, bows, or hearts woven in the filigree pattern. Simple engagement ring settings - prongs were the most popular option, though some rings incorporated bezel settings. 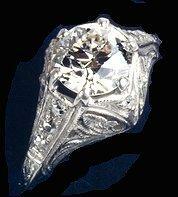 Accents completely surrounding the ring on each surface, including the crown, sides of the shank, and the band itself. Milgrain edges or etchings to add texture to the metal of the ring. Antique, traditional styling and simple diamond shapes - round stones are by far the most prominent, though cushion cut diamonds or emerald cut diamonds are also available. 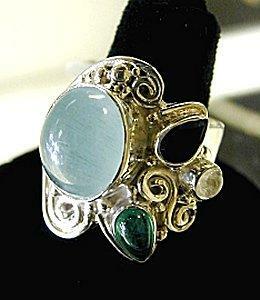 Limited use of semi-precious gemstones as center stones; sapphires, rubies, and aquamarines were occasionally used. Use of white gold, silver, and platinum almost exclusively - yellow gold Edwardian rings are exceedingly rare. Edwardian engagement rings were invariably miniature works of art, each with a distinctive style and elaborate detail. It should be noted that no true Edwardian ring could be matched as a bridal set: the rings were made to be worn individually and adding a second piece of jewelry would obscure delicate details. Vintage engagement rings are exceedingly popular, but it can be difficult to find high-quality Edwardian rings that truly are vintage pieces or antique engagement rings. Because this style of ring is resurging in popularity, however, couples have the option of choosing modern replica rings fashioned in the Edwardian style. Modern rings will have several notable style differences, however. Modern diamond cuts are more precise because of advances in lapidary technology that allow for finer precision. Because of this, most modern gems will have more fire and sparkle than their vintage counterparts. At the same time, this also allows couples to choose a wider range of diamond shapes to incorporate into an Edwardian ring. Similarly, the diamond color of modern stones is likely to be better - colorless stones are preferred today, whereas during the Belle Epoch, stones with a heavier color tint were treasured for their uniqueness. One characteristic that both modern and vintage Edwardian engagement rings share is the attention to detail and superb quality of workmanship. While many people assume that older rings may have less precise designs, in fact the intricacy and delicacy of the scrollwork and filigrees is a hallmark of the Edwardian period and the engagement rings from that era are exceedingly well made. Modern rings, naturally, can take advantage of laser sculpting and other technological advancements to replicate that precision easily and much more cost effectively. As with any antique engagement ring, authentic Edwardian styles can be difficult to locate. Estate sales and private collections may have some rings available, while specialized antique jewelry retailers can often locate a selection of Edwardian period rings for interested couples. Modern rings can be found from different designers, and many engagement ring stores will offer a range of styles reminiscent of Edwardian engagement ring designs. Couples may also find a wide range of these delicate styles from online merchants, such as Fay Cullen and London Victorian Rings. Engagement ring prices for Edwardian styles vary greatly depending on the age of the ring, its detail, the quality of the stones, and the overall quality of the piece. Vintage pieces typically cost from $6,000 to $12,000, while modern Edwardian-inspired replicas can usually be found for much less. An engagement ring is undeniably romantic, and Edwardian engagement rings embody that romance with intricate patterns and delicate details. These specialized engagement rings are a true testament to the beauty not only of fine jewelry, but also of a fine relationship.